Chinese handwriting has infinite power to express differences of character and cultivation. There are numerous styles, or scripts, in which Chinese characters can be written, deriving from various calligraphic and historical models. Most of these originated in China and are now common, with minor variations, in all countries where Chinese characters are used. These characters were used over 3,000 years ago. The Shang dynasty Oracle Bone and Zhou dynasty scripts found on Chinese bronze inscriptions being no longer used, the oldest script that is still in use today is the Seal Script (simplified Chinese: traditional Chinese. It evolved organically out of the Spring and Autumn period Zhou script, and was adopted in a standardized form under the first Emperor of China, Qin Shi Huang. The seal script, as the name suggests, is now only used in artistic seals. Few people are still able to read it effortlessly today, although the art of carving a traditional seal in the script remains alive; some calligraphers also work in this style. 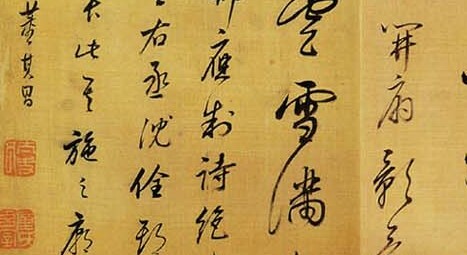 Scripts that are still used regularly are the “Clerical Script” (simplified Chinese: traditional Chinese: of the Qin Dynasty to the Han Dynasty, the Weibei the “Regular Script” (simplified Chinese: traditional Chinese: used for most printing, and the “Semi-cursive Script” (simplified Chinese: traditional Chinese used for most handwriting. The Cursive Script (simplified Chinese: traditional Chinese: literally “grass script”) is not in general use, and is a purely artistic calligraphic style. The basic character shapes are suggested, rather than explicitly realized, and the abbreviations are extreme. Despite being cursive to the point where individual strokes are no longer differentiable and the characters often illegible to the untrained eye, this script (also known as draft) is highly revered for the beauty and freedom that it embodies. Some of the Simplified Chinese characters adopted by the People’s Republic of China, and some of the simplified characters used in Japan, are derived from the Cursive Script. The Japanese hiragana script is also derived from this script. There also exist scripts created outside China, such as the Japanese Edomoji styles; these have tended to remain restricted to their countries of origin, rather than spreading to other countries like the standard scripts described above. One of China’s most popular folk-arts is paper-cut. Its origin should be closely connected with the invention of paper during the Han dynasty (206 B.C.-221 A.D.). Paper-cut are used for religious purposes, for decoration and as patterns. As paper was highly precious in the early days, the art of paper cutting first became popular in the royal palaces and houses of nobility as a favorite pastime among court ladies. Later, during the 7th through 13th centuries, paper cutting was immensely popular during folk festivals and celebrations. By the 14th century, the art had spread to the Middle East and Europe; and by the 15th century onward, paper cut art works had become and integral part of the everyday life of the people. However, the art of paper cutting was on the verge of dying out during the past century as old China experienced successive years of the disaster of war brought on by domestic turmoil and foreign invasion. Amidst a myriad of changes in their lives, most people had no leisure time to engage in the study of the art of paper cutting. Now paper-cut are chiefly used as decoration. They ornament walls, windows, doors, columns, mirrors, lamps and lanterns in homes and are also used for decoration on presents or are given as presents of themselves. Chinese painting is one of the oldest continuous artistic traditions in the world. The earliest paintings were not representational but ornamental; they consisted of patterns or designs rather than pictures. Stone Age pottery was painted with spirals, zigzags, dots, or animals. It was only during the Warring States Period (403-221 B.C.) that artists began to represent the world around them. Painting in the traditional style is known today in Chinese as guó huà meaning ‘national’ or ‘native painting’, as opposed to Western styles of art which became popular in China in the 20th century. Traditional painting involves essentially the same techniques as calligraphy and is done with a brush dipped in black or colored ink; oils are not used. As with calligraphy, the most popular materials on which paintings are made of are paper and silk. The finished work is then mounted on scrolls, which can be hung or rolled up. Traditional painting also is done in albums and on walls, lacquerwork, and other media. Freehand – Shui-mo loosely termed watercolour or brush painting. The Chinese character “mo” means ink and “shui” means water. This style is also referred to as “xie yi” or freehand style. Artists from the Han (202 BC) to the Tang (618-906) dynasties mainly painted the human figure. Much of what we know of early Chinese figure painting comes from burial sites, where paintings were preserved on silk banners, lacquered objects, and tomb walls. Many early tomb paintings were meant to protect the dead or help their souls get to paradise. Others illustrated the teachings of the Chinese philosopher Confucius or showed scenes of daily life. Many critics consider landscape to be the highest form of Chinese painting. The time from the Five Dynasties period to the Northern Song period (907-1127) is known as the “Great age of Chinese landscape”. In the north, artists such as Jing Hao, Fan Kuan, and Guo Xi painted pictures of towering mountains, using strong black lines, ink wash, and sharp, dotted brushstrokes to suggest rough stone. In the south, Dong Yuan, Ju Ran, and other artists painted the rolling hills and rivers of their native countryside in peaceful scenes done with softer, rubbed brushwork. These two kinds of scenes and techniques became the classical styles of Chinese landscape painting. China has a long history in woodcarving. Picturesque in contours, concise in intended meanings, exquisite in chiseling skills, Chinese woodcarving embodies harmony, in terms of the relationship between each component and the carving as a whole. Based on customs and myths, its themes in general are classified into the following four categories: auspicious designs, such as “excessive happiness”, “full crops harvest” “peaceful and hearts’ desire” “longevity” “good luck”; figures for enjoyment purpose, such as characters in operas, ancient heroes, historical novels, myths, fables; local people’s life style, such as farming, harvesting, sericulture, weaving, herding, hunting, sewing, commerce, love, etc. ; fowls and beasts, plants, vegetables and fruits that people are familiar with. Beasts, such as chicken, duck, goose, rabbit, pig, cow, horse, deer, bat, fish and shrimp. Woodcarving takes various forms: low relief, deep relief, transparent relief and full relief. Many hollowed-out deep relief are pieced together with full relief. Varied in chiseling techniques according to different materials, strengthened in sense of space, they constitute a kind of multiplayer deep relief similar to full relief, which is very pleasant to see. The content of the tradition pattern of modeled after an antique embroider-small pieces of cloth is: supernatural being congratulate on his or her birthday, like the Eight Immortals crossing the sea, the boy prostrate oneself before the image of Kwan-yin Bodhisattva, one hundred children pattern, one hundred the god of longevity pattern, nine dragons in sea, two dragons playing with a pearl and dragons-phoenix present lucky etc. The pattern of the four-leaf screen is: the figures, the water from a mountain plume and flowers and plants etc. The pattern of the figures is: dream of the red chamber, like the Eight Immortals crossing the sea, traditional Chinese painting of beautiful women. The pattern of the scenery is: The water from a mountain, the painting of flowers and birds in traditional Chinese style etc. The embroider-small pieces of cloth has many model and form, which is includes: the round the square the hexagon and the rectangle etc. The embroider-cushion is the practical products; it’s more than ten patterns.